Aphloïol in cosmetic use to improve skin barrier quality and efficacy. Samuel GUENIN, PhD*, Francois-Xavier BERNARD, PhD*, Jean-Renaud ROBIN, Christian LUBRANO and Céline LAPERDRIX, PhD. 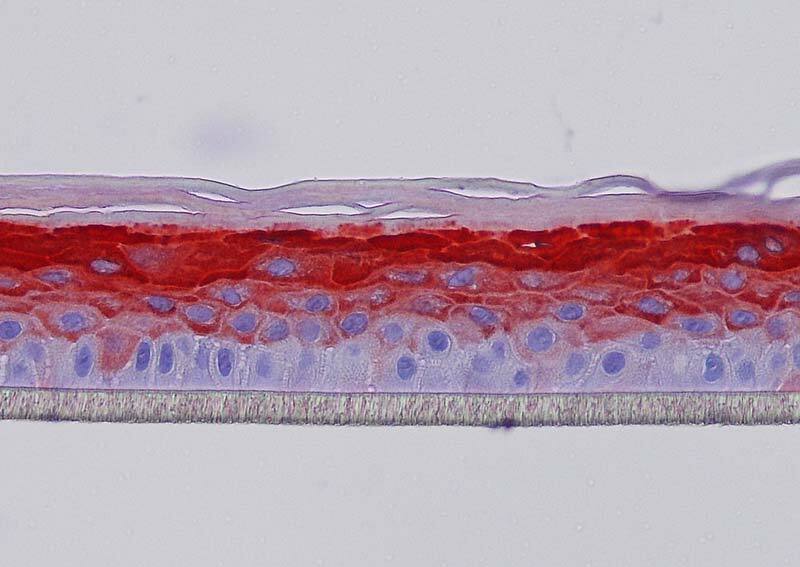 Human skin acts (mainly through epidermis) as a protective barrier against environmental stresses (UV-irradiations, chemical, mechanical solicitations and urban pollution). 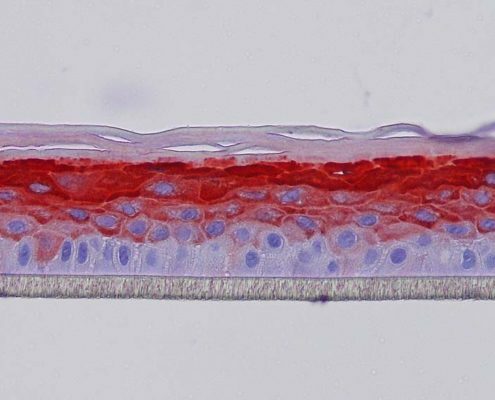 These stresses contribute to the progressive disruption of skin architecture and participate to tissue-ageing processes. 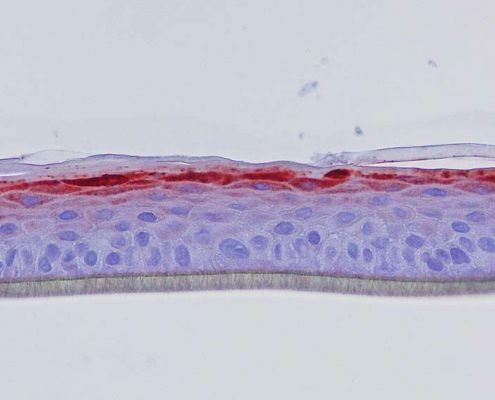 Barrier function of the skin is mainly ensured by three different mechanisms in the epidermis: keratinocyte differentiation, intercellular junction and lipids synthesis. 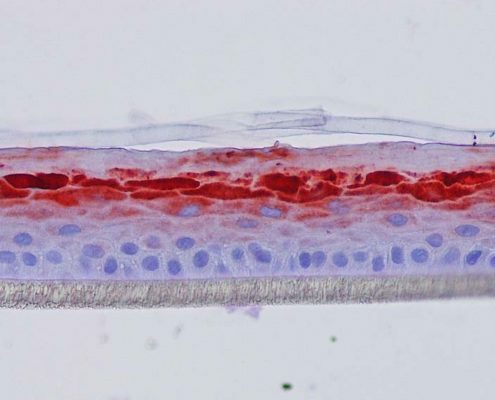 Keratinocyte differentiation is characterized by the concomitant expression of cytoskeletal fibrous proteins (keratins 5, 14, 1, 10,…), junction proteins of desmosomes (desmoglein, desmocollin), late differentiation markers (transglutaminase M1, filaggrin), proteins of the cornified envelopes (involucrin, small proline rich proteins). 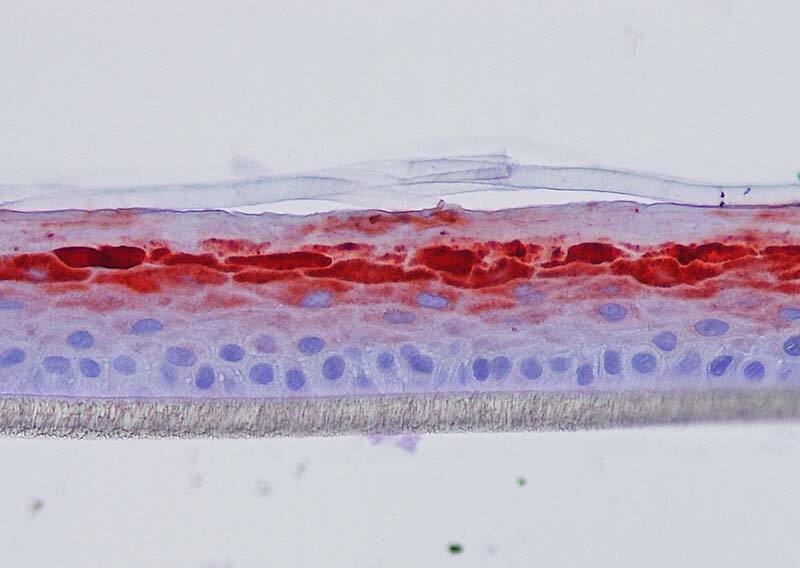 The skin barrier function is also mediated by lamellar lipid enriched membranes, exposed to the extracellular part of corneocytes, composed of ceramides. Aphloïol (syn. mangiferin) is a photostable C-glucoside xanthone present in vegetal species (e.g. Aphloïa theaformis and Mangifera indica). Like other polyphenol family members, it has an anti-oxidant effect. It has also several therapeutics activities against metabolic disorders, infectious diseases, inflammation, cancer and auto-immune disorders. 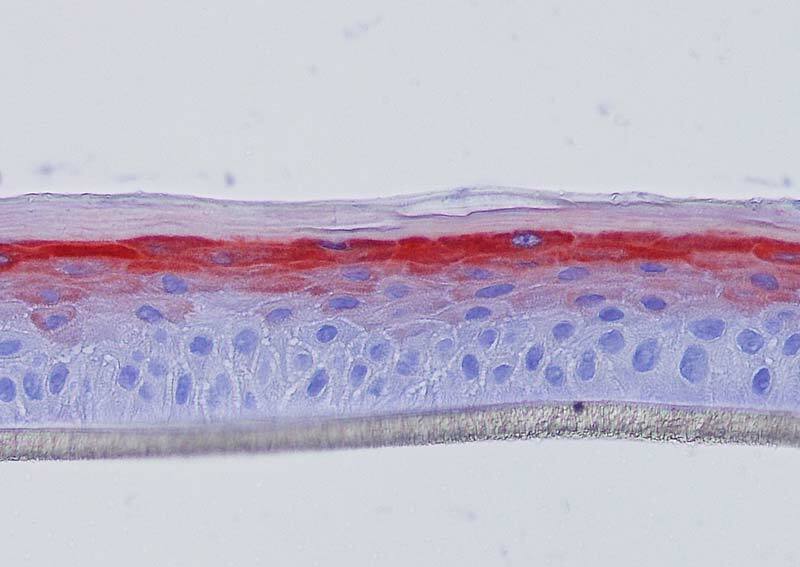 We had previously shown skin reparation properties of Aphloïol (decrease of collagen fragmentation in vivo), protective effects against environmental stresses (increase of HSP expression and decrease of matrix metalloproteinases) and anti-inflammatory activities (inhibition of pro-inflammatory cytokines IL-6 and TNF-α). 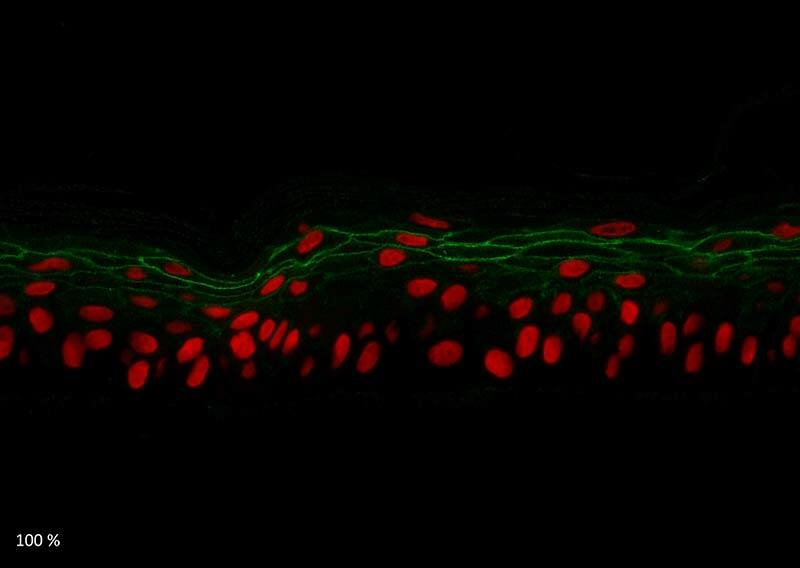 In the present study, we identified new properties of Aphloïol in improving skin barrier function, especially by promoting keratinocyte differentiation, synthesis of transmembrane glycoprotein and lipid neosynthesis. 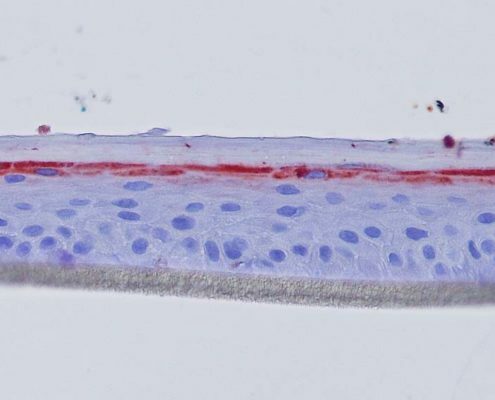 To extend our knowledge of Aphloïol effects on keratinocytes biology, a full genome analysis was performed (microarray using Affymetrix® U219 chip). 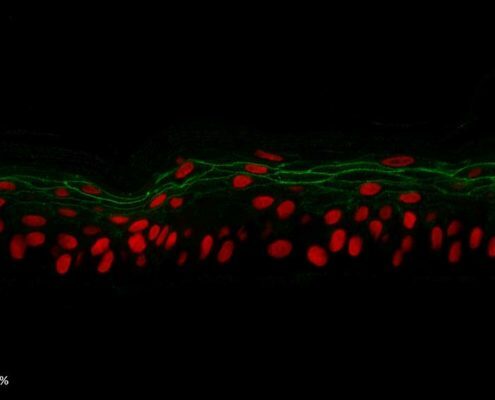 The results indicated that this compound induced a clear overexpression of genes involved in differentiation, cell adhesion and cohesion, and the downregulation of genes involved in cell migration and matrix degradation (MMP) (Figure 1). 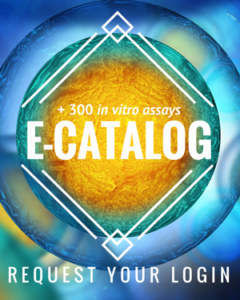 These effects on keratinocyte differentiation and epidermal cohesion were confirmed by RT-qPCR analysis. 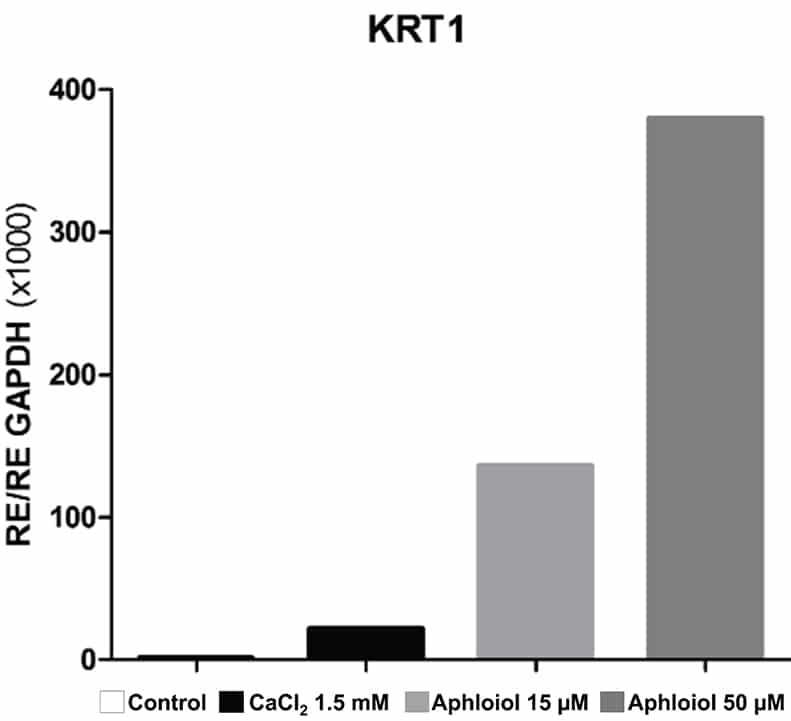 As showed in Figure 2, Aphloïol treatment stimulated the expression of genes involved in keratinocyte differentiation (Filaggrin [FLG], keratin 10 ([KRT10], keratin1 [KRT1] and small proline-rich protein 2A [SPRR2A]) and of two cadherins involved in inter-cellular junctions (desmoglein 1 [DSG1] and desmocollin 1 [DSC1]). 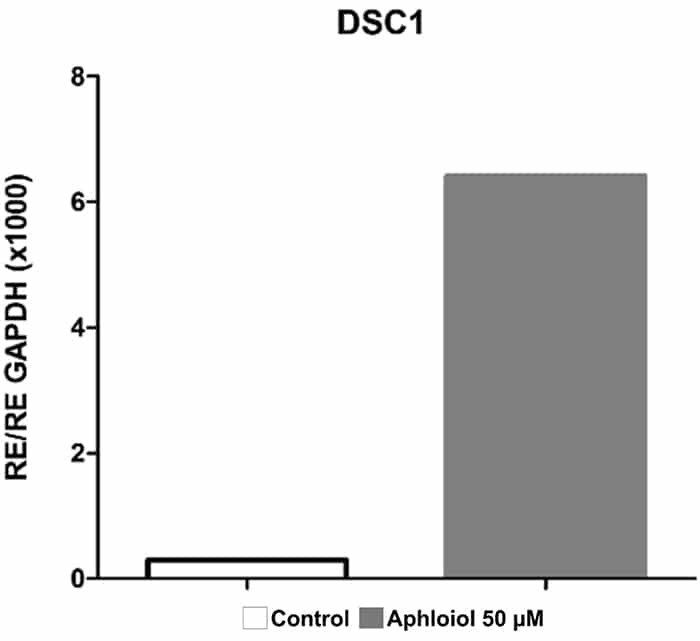 It should be noted that Aphloïol effects were greater than those of calcium (CaCl2), a well-known inducer of keratinocyte differentiation. 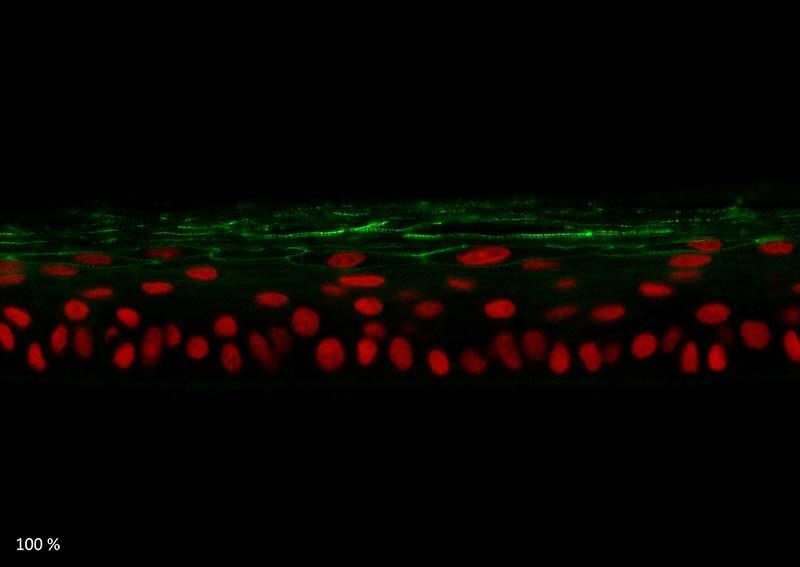 Increased protein expression of keratin 10 and filaggrin was confirmed by immunostaining on keratinocyte monolayer (data not shown). 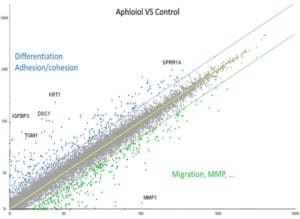 Figure 1: Scatter plot representation of the transcriptomic effect of 48 hours normal human keratinocytes treatment with 50 µM Aphloïol versus non-treated control cells. 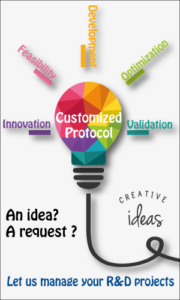 The expression of different markers was evaluated by full transcriptome analysis using a U219 chip. Each dot corresponds to the expression of one gene. 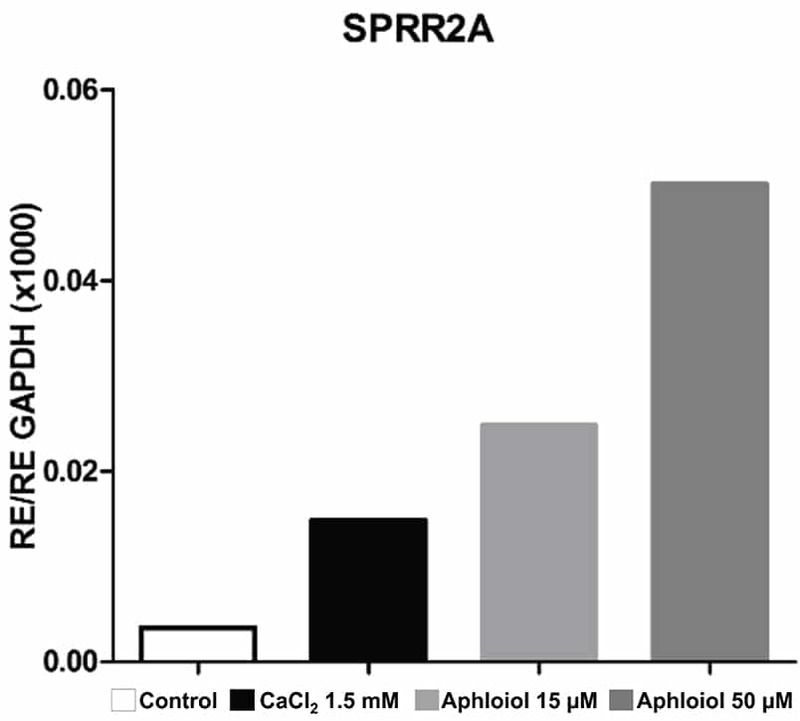 Figure 2: Effect of Aphloïol and CaCl2 on mRNA expression of epidermis differentiation markers in normal human keratinocytes after 48h of incubation. Results of RT-qPCR analysis were normalized with GAPDH expression. 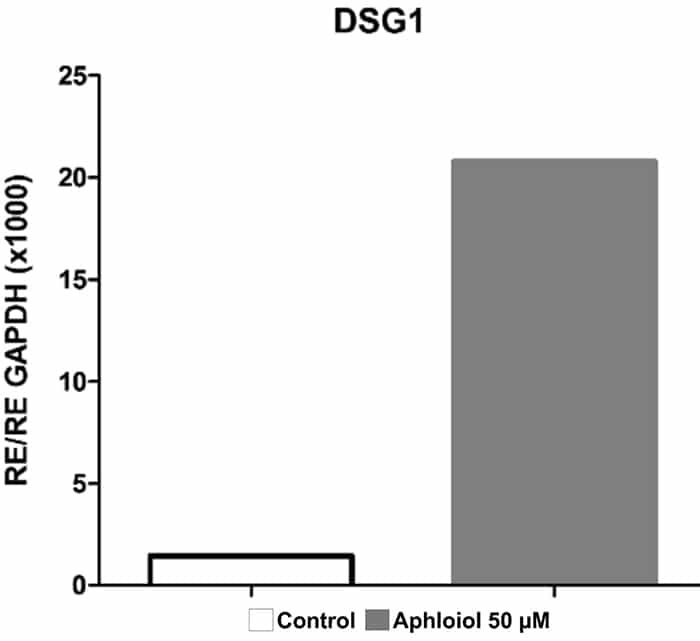 In order to get deeper in the differentiating properties of Aphloïol, its effect on transglutaminase-1 (TGK) expression and activity was also evaluated. TGK is a key enzyme for epidermal barrier formation, where it catalyzes covalent peptide bonds between protein precursors responsible for stratum corneum cohesion. The results indicated that this poly-phenol induced a clear increase of TGK expression (data not shown) but also an increase of its activity in NHEK monolayers, even if the amplitude of the stimulation was weaker than that of calcium (Figure 3). 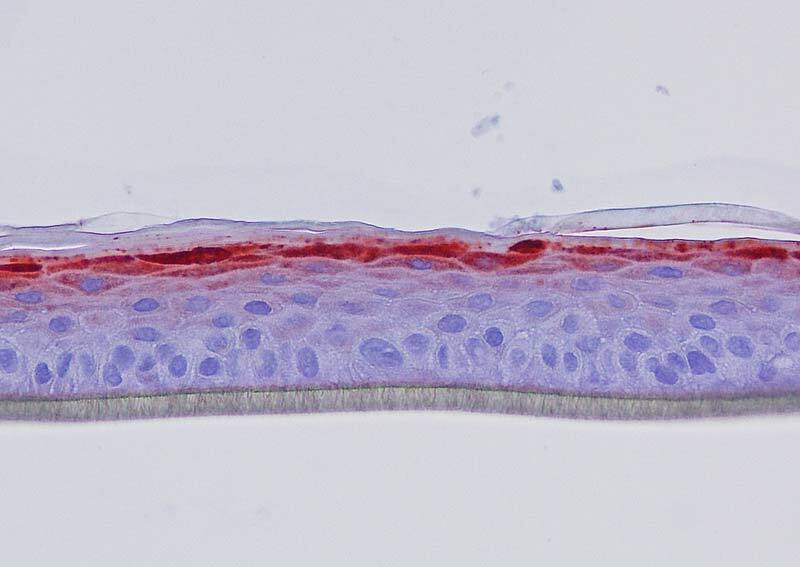 To get closer to physiological conditions we investigated Aphloïol effects on reconstructed human epidermis (RHE). 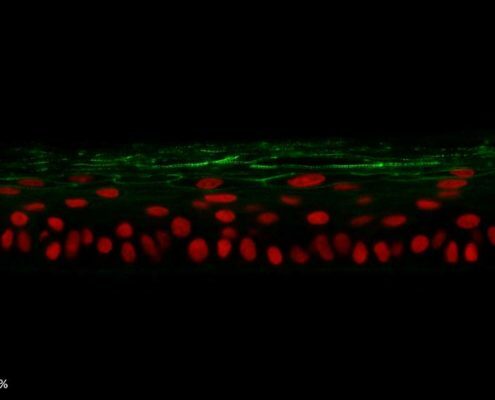 In optimum reconstruction conditions, switch from liquid to air-liquid phase induces an important keratinocyte differentiation that is difficult to over-stimulate. Therefore, it was relevant to perform the experiments in non-optimum culture conditions, e.g. 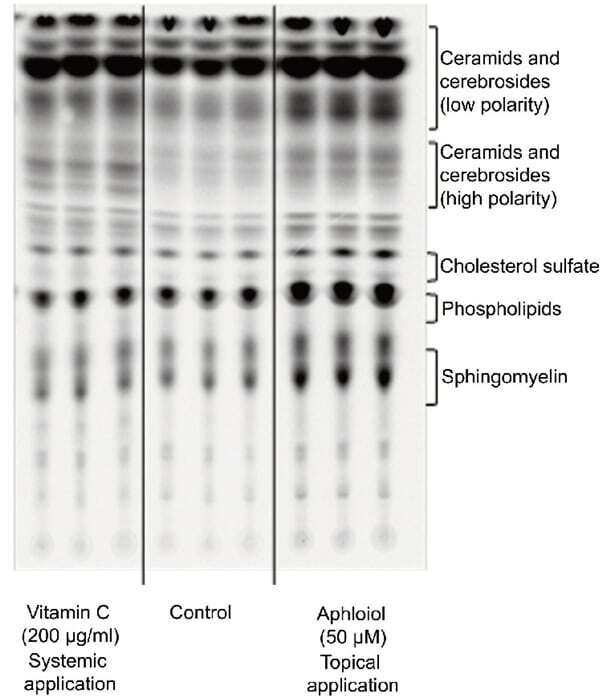 vitamin C deficiency, and to compare Aphloïol and vitamin C effects on RHE differentiation. 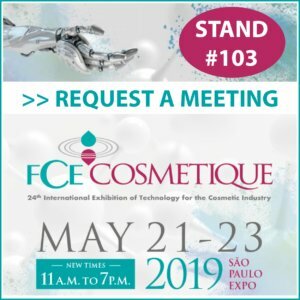 Keratin 10, filaggrin, desmoglein 1, desmocollin 1 and involucrin expression were increased after 7 days of systemic treatment of RHE with Aphloïol (50 µM) compared to control (Figures 4 and 5). 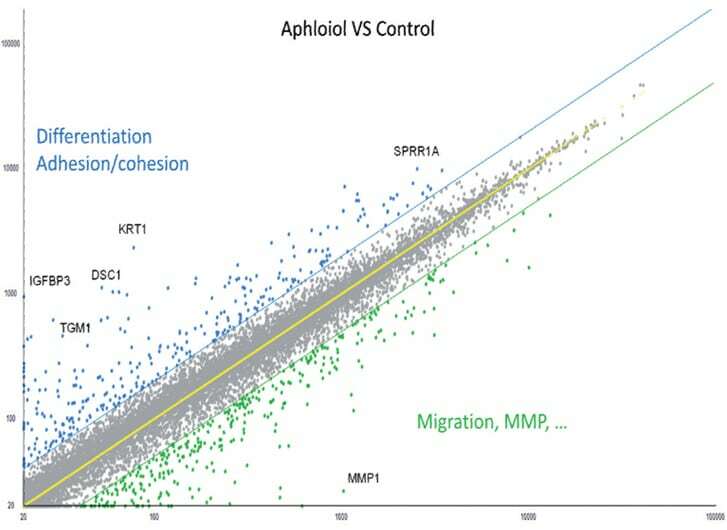 Finally, lipid neosynthesis was studied in RHE to confirm the pro-differentiating activity of Aphloïol. 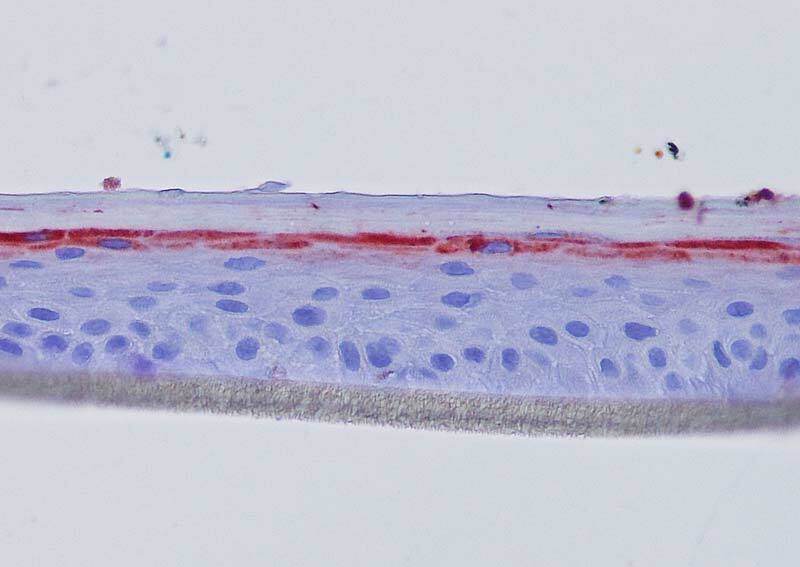 As shown on the chromatography profile (Figure 6), Aphloïol stimulated neosynthesis of several lipid categories including ceramids/cerebrosids, lipids of the outermost epidermis layer, the major class of lipids involved in cutaneous permeability and intercellular cohesion. 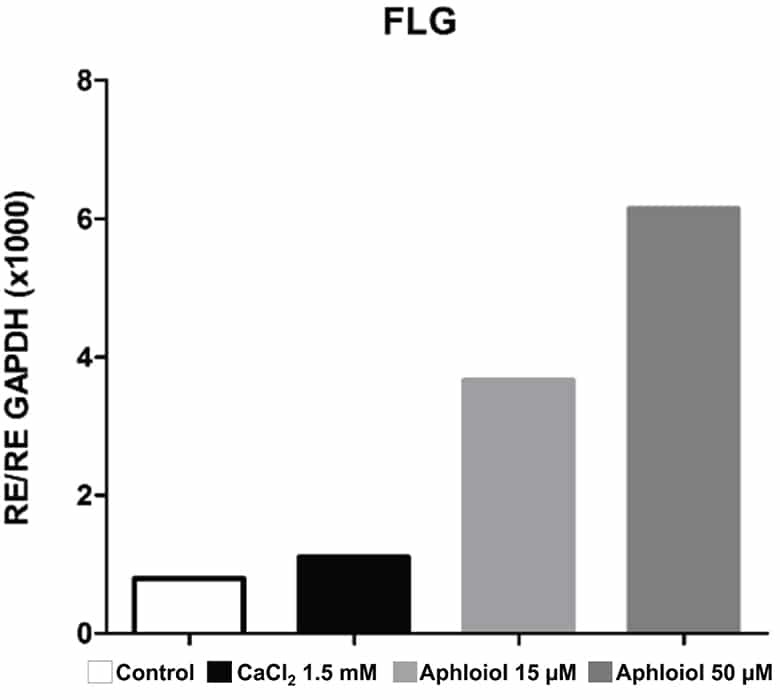 Figure 4: Effect of Aphloïol (50 µM) and vitamin C (200 µg/ml) on keratin 10 (K10) and filaggrin (FLG) expression in RHE after 7 days of treatment (systemic application repeated every 2 or 3 days). 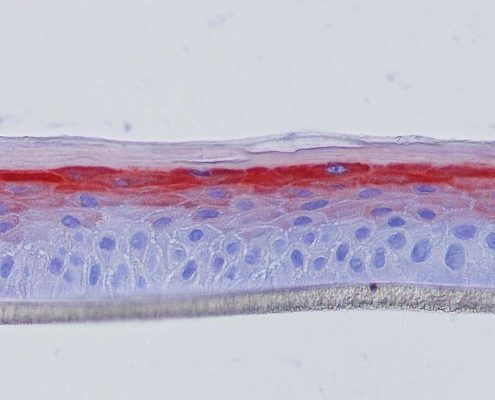 Analysis by immunohistochemistry (formaldehyde fixation, incubation with 3 % H2O2 solution for 5 min, incubation with primary antibody revealed by streptavidin-peroxidase detection kit coupled to the AEC chromogen and hematoxylin coloration). 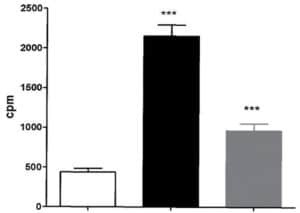 Figure 5: Effect of Aphloïol (50 µM) and vitamin C (200 µg/ml) on desmoglein 1, desmocollin 1 and involucrin, expression in RHE after 7 days of treatment (systemic application repeated every 2 or 3 days). 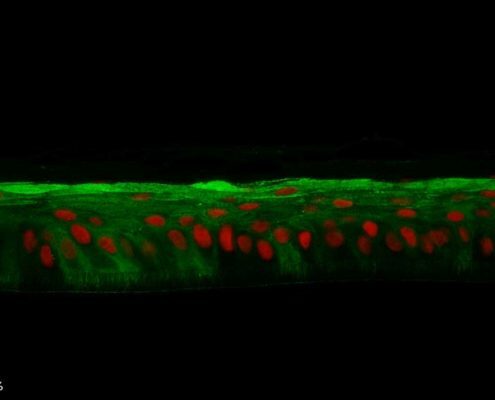 Analysis by immunofluorescence (formaldehyde fixation, incubation with primary antibody revealed by a secondary antibody Alexa 488-coupled and nuclei were stained with propidium iodide). Figure 6: Effect of Aphloïol (50 µM, topical application) and vitamin C (200 µg/ml, systemic application) on polar lipid neosynthesis in RHE. At day 3, the medium was replaced with treatment medium supplemented with [14C]-acetate. At day 5, medium containing the tracer was removed and replaced by fresh medium and vitamin C treatment was renewed. RGE were incubated for 2 additional days. Lipids were extracted as described by Bligh and Dyer 2. Then ceramids, cerebrosides, cholesterol sulfate, phospholipids and sphingomyelin were separated by thin layer chromatography. 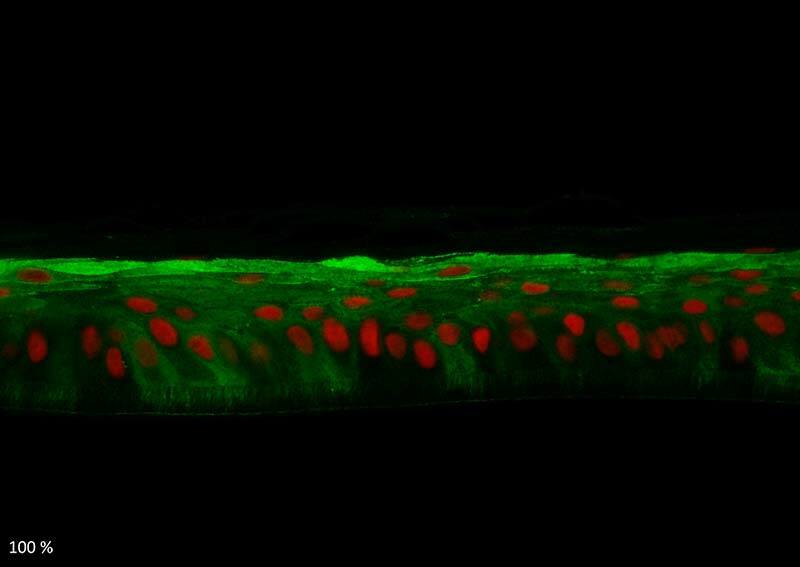 All these results confirmed Aphloïol ability to stimulate keratinocyte differentiation including the late differentiated layer of the epidermis, i.e. stratum corneum, and its ability to enhance skin barrier permeability / protection qualities thanks to lipid neosynthesis. 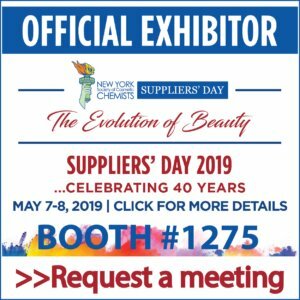 Aphloïol had been described previously for its repair and protecting properties against environmental stresses (atmospheric pollutants, UV …). 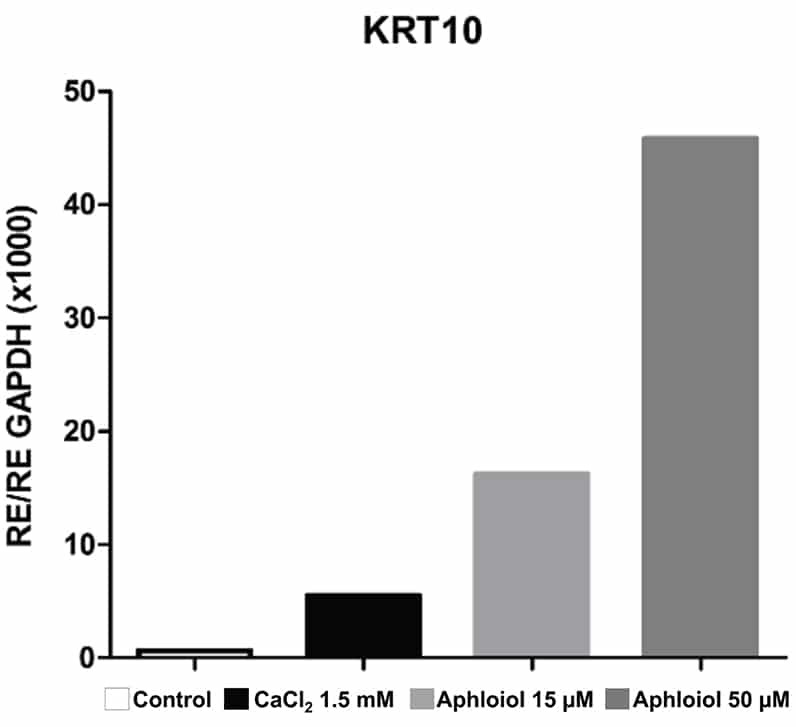 Here we demonstrated a new biological effect of this molecule: keratinocyte differentiation stimulation, characterized by the increase of several markers at the transcript or protein level (tranglutaminase 1, keratin 1 and 10, filaggrin, involucrin, small proline rich protein, cadherins, lipid neosynthesis). All this data indicates a new way of action of Aphloïol in cosmetic use to improve skin barrier quality/efficacy. 1- Telang M et al., Expert Opin Ther Pat. 2013 Dec, 23(12):1561-80; Boniface K et al., J Immunol. 2007 Apr 1, 178(7):4615-22.